The striker hit his late spot-kick way over the bar and into the car park, following Sam Wood's foul on James Roberts, leaving Michael Appleton's side five points above the relegation zone. "First half was very nip and tuck, I think the penalty decision was very dubious. "Second half we came out and we knew what we had to do. With those fans behind us it was a fantastic 45 minutes. "I thought we well deserved the win. Even though there was a missed penalty at the end, I can't believe anyone would leave this ground saying that Wycombe didn't deserve something. "There's still a long way to go and it's feet on the ground. We are 20 points away from the bottom two." Match ends, Oxford United 1, Wycombe Wanderers 2. Second Half ends, Oxford United 1, Wycombe Wanderers 2. Substitution, Wycombe Wanderers. Daniel Rowe replaces Paul Hayes. Penalty missed! Bad penalty by Danny Hylton (Oxford United) right footed shot is too high. Danny Hylton should be disappointed. Penalty Oxford United. Callum O'Dowda draws a foul in the penalty area. Penalty conceded by Sam Wood (Wycombe Wanderers) after a foul in the penalty area. Attempt missed. Joe Riley (Oxford United) right footed shot from outside the box is too high from a direct free kick. Substitution, Oxford United. Callum O'Dowda replaces Michael Collins. Attempt saved. James Roberts (Oxford United) right footed shot from the right side of the six yard box is saved in the centre of the goal. 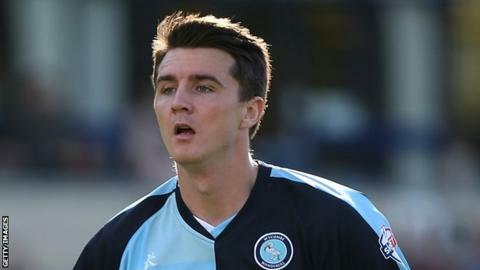 Matt Bloomfield (Wycombe Wanderers) wins a free kick on the left wing. Substitution, Oxford United. James Roberts replaces Alfie Potter. Attempt missed. Josh Scowen (Wycombe Wanderers) right footed shot from outside the box is too high. Goal! Oxford United 1, Wycombe Wanderers 2. Peter Murphy (Wycombe Wanderers) header from the centre of the box to the bottom left corner. Assisted by Sam Wood. Attempt missed. Paul Hayes (Wycombe Wanderers) right footed shot from the right side of the box is high and wide to the right following a set piece situation. Aaron Pierre (Wycombe Wanderers) wins a free kick on the left wing. Goal! Oxford United 1, Wycombe Wanderers 1. Paul Hayes (Wycombe Wanderers) right footed shot from the centre of the box to the top right corner. Substitution, Wycombe Wanderers. Hogan Ephraim replaces Steven Craig. Corner, Wycombe Wanderers. Conceded by Tareiq Holmes-Dennis.